It’s only Round 1. They were expected to slide. You’re just being too salty. Yes, I can hear the comments that it is far too early to write off a team of the calibre of the Sydney Swans. As a red-and-white diehard I have experienced terrific backs-to-the-wall performances over many seasons and have been spoilt with sustained success. I am also of the opinion you need to take a step back to move forward, so I have no worries with the Swans missing the eight or falling for a couple of years. What troubles me most is that this is happening in 2019, when I really thought we would start to see a fresh approach to a game plan that has become progressively redundant since the 2016 grand final. Coach John Longmire jagged the 2012 premiership built around an ‘absorb and slingshot’ approach and with a multi-faceted forward line – the leading goal kicker was Lewis Jetta – to defeat Hawthorn in a terrific grand final. Fast forward to Saturday night, and up until half-time the Swans had kicked five goals in their previous six quarters of football. The score was one goal, five behinds against a severely depleted Bulldogs defence. This built on the four goals in their humiliating finals defeat to their little brothers across the Anzac Bridge, GWS, two of which came in absolute junk time in the last quarter. Any football fan moves into the new season with natural optimism, and there was significant talk both externally and certainly from within the Swans around the need to revisit a game plan that has become as useful as an ashtray on a motorbike. But Saturday brought some nervous tremors. We were seeing a Groundhog Day. This is a rundown of this regression and where there is no evidence of change. There continues to be no pace in the midfield, and the Bulldogs just towelled the Swans in the centre. Warriors like Josh Kennedy and Luke Parker will break tackles or dispose under pressure, but their delivery into the forward line from a clearance is often compromised in pursuit of the hard ball, and kicks are thus scragged or misguided. There is no punishing outside runners. When Kennedy and Parker were rested, Isaac Heeney, Ryan Clarke or Callum Mills went in. They are courageous players, but it is the same crash-and-bash football to drive the ball forward. The Swans have in recent years traded both Lewis Jetta and Gary Rohan. While both were flashy and inconsistent players, they did give the Swans pace at vital moments of some matches during a season. The Swans have this year brought in the aforementioned Ryan Clarke from North, another Kennedy Parker-lite model of inside mid. There is no-one at present demonstrating the capability to consistently break the line and utilise the terrific inside players the Swans have. Ollie Florent may be an answer, but the coaching appears to have him in deep defence or the interchange rather than where he is needed on the wing to add dash to his own development as a player. Who is coaching the forward line? I have been a consistent critic of the Swans forward line for the last two or three years in terms of functionality and forward entry. Just sit next to me at a game. I find it amazing that forward coach Steve Johnson and Longmire cannot collectively transpose their on-field playing genius and translate this into a well-balanced and unpredictable attack. Lead patterns are a complete aberration at the moment – last night you could see players crashing into each other, and there is no one or two playing the classic front-and-centre role to crumb a goal. Tom Papley (Ben Ronke wasn’t selected last night) was playing as a quasi outside on-baller at times too far up the ground. The bottom line is you are doomed going into a game with three talls and no viable crumbing options. The Dogs rebounded repeatedly and at a canter. Recent history will tell you the great sides of any given year can lock a ball in the forward 50 and continuously build pressure to ball-ups or turnovers that lead to goals. But wait, there’s more. Forward entries are consistently not being played to a forward’s advantage. The ball is not played into space to benefit a forward’s lead or to reap the benefits of good body position on an opponent. The Bulldogs had too many easy spoils and uncontested marks in the defensive 50 from blazing kicks into the forward line. For those watching last night, the most notable culprit was Will Heywood, who drove the ball into Franklin in a one-on-three situation at a crunch time in the match, ignoring an unmarked Heath Grundy 40 metres out from goal. This has been coming, though. The nadir for me on the same theme was last year’s humiliating loss to the Gold Coast Suns. Steven May was the lone player patrolling the Swans 50 in the second half and had numerous uncontested marks and counter-attacking opportunities. I actually think it’s just better to admit there isn’t a structure. 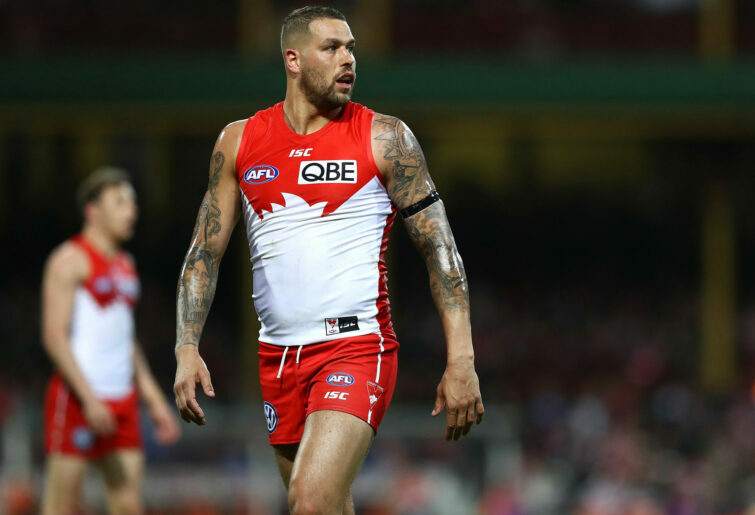 As an extension to the last theme on forward-line cohesiveness, Longmire has not mastered the art of utilising Lance Franklin, particularly on the small but wide confines of the SCG, where he should be played semi-permanently on a wing. Buddy is the Swans’ best field kick in addition to his goalscoring wizardry. Dermot Brereton was highly critical of the Swans mid-2018 at a time when pundits were critiquing Franklin’s value to the team at the midway point of his nine-year deal. Brereton can say a lot of strange things, but his point of view on not maximising the greatest forward of his generation rings true in this instance. So how do you use Buddy alternatively? A useful blueprint can be obtained from Alastair Clarkson, who played Buddy on the wing at the SCG against the Swans in 2011. Franklin had 28 touches and kicked 6.6 in an eight-goal win. Franklin’s Achilles heel is his pack marking, and it pains me to watch the consistent and aimless long-bombing to Franklin in congestion in an attempt to score. Usually a coach’s time is up with an AFL side when you see players lacking any sense of instinct to take the game on or overburdened by message or implications for the next step in the game. On Saturday night for the Swans the signals were indecisiveness with the ball. Sometimes they just took too long or adopted a risk-averse easy-option approach, and in many instances it was the ‘first-look’ sideways approach. Sydney’s inability to effectively utilise the corridor saw them take a familiar circuitous route to goal, which can be easily repelled or spoiled across half back. Yes, the Swans did turn up for about 17 minutes in that last quarter, but we all know footy goes for about 120 minutes. The team is terrified of risk. To change, it does go to a reset of values. Fans want 90 to 100 goals from the Buddy show. They want to see dashing and run and young players having the confidence to showcase their skills. They want to see a rebuilding team that is not necessarily winning every week but is at least competitive, entertaining and willing not to die wondering. 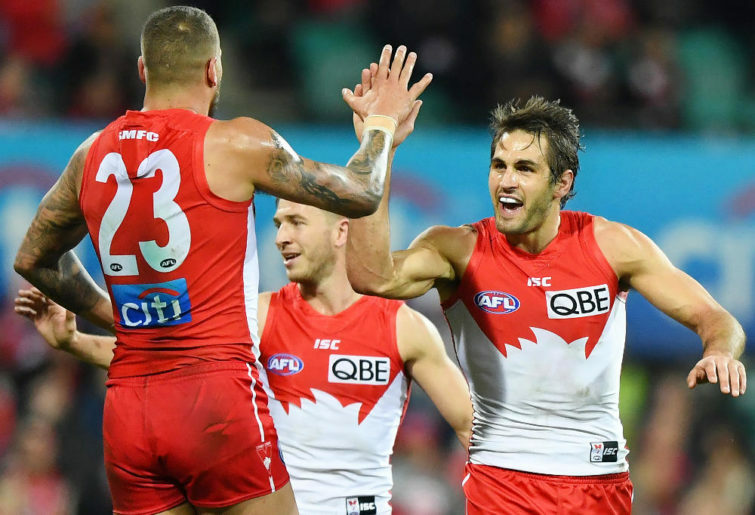 Since 2016 the product we are getting is something that may see the Swans on the periphery of the finals but eliminated in the first week at best. It is a holding pattern in which measurement is seen on making finals but not on being damaging once there. While they can help, warriors like Nick Smith, Heath Grundy and Jarred McVeigh are not the answers to our next premiership puzzle. Defensive mindsets must change. 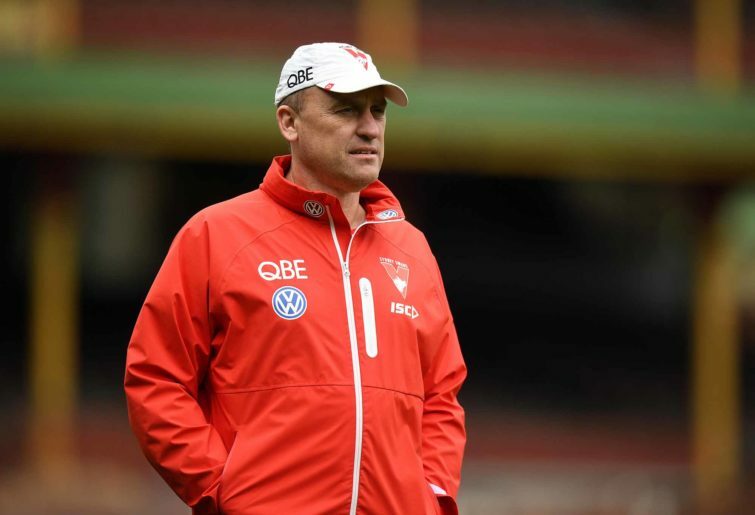 We are in Longmire’s 18th year in a coaching role at the Swans and his ninth in charge. Hee has a fantastic record and is a brilliant man manager, but he will be looked upon as tactically benign if he cannot turn things around in a hurry over this year and in the final year of his deal in 2020. Wow, that feels better after a Round 1 rant! It may need a year or two for the Swans to drop before they bounce back, but the question must be: should the horse be there to guide the reins?